54 Bottle Connoisseurs Deluxe Large Foldable Gray Metal Wine Rack – My Home Wine Bar ! Amazon Price: $99.99 (as of February 4, 2019 2:41 am - Details). Product prices and availability are accurate as of the date/time indicated and are subject to change. Any price and availability information displayed on the Amazon site at the time of purchase will apply to the purchase of this product. 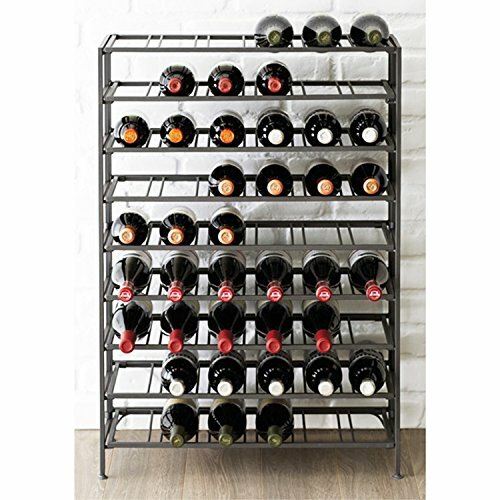 Contemporary and sleek, space maximizing folding wine rack elegantly holds and displays up to 54 wine bottles in your kitchen or wine cellar. The clever design allows easy assembly (no tools required), and folds flat when not in use. Ideal for use in your wine cellar or any room at home, and makes a perfect Christmas or housewarming gift. Approximate Dimensions (in inches): 36 H x 24.75 W x 9.75 D.